Marcus Berkmann is someone who really ought to write about cricket more often than he does. His first book on the game, 1995’s Rain Men, was well received – and was responsible for a string of imitators chronicling the trials and tribulations of playing for an enthusiastic but generally hopeless team. Ten years later Zimmer Men updated the story – in the meantime he was writing a regular back-page piece, Last Man In, for the Wisden Cricketer magazine. This more recent offering tells the story of the Ashes series from 1972, Marcus’s earliest memories of the historic rivalry, to (very briefly) 2006-07, from the viewpoint of the England supporter. It hardly needs adding that Australia have been on top for most of that period – which accounts in part for the book’s subtitle – “35 Years of Humiliation (and about 20 Minutes of Ecstasy) watching England v Australia.” Some matches were watched live, but most on TV – and often he finds he has to bunk off work or miss lessons to catch the action. When England are upsetting the form book at Edgbaston in 1997, for example, he’s at a wedding with his girlfriend, but manages to find a set in another room. “Why do you keep disappearing?” he gets asked, suspiciously. Unfortunately the only live play he manages to see is the long partnership between Taylor and Blewett on day three. There’s a big supporting cast of friends, too. They make the book, really. Tim, Julian, Andy and others pop up regularly – they’re never properly introduced, but I assume they’re friends of the writer – and chip in with their own memories. Again, some were at the games, but for the most part they’re watching on the BBC, Channel 4 or Sky. Or listening to radio broadcasts from Australia, which many of us of a certain age will attest have their own unique allure: “it’s a very personal thing, following cricket” remarks Ben. “Lying in bed listening to Test Match Special into the early hours: it’s like a vigil, a semi-devotional sort of thing. And feeling the searing heat … and here it’s cold, and you’re tucked up in bed.” Remembering the commentary from Melbourne in 1977’s Centenary Test (covered here in detail, although the one-off matches of 1980 and 1988 aren’t mentioned), I know exactly what he means. Ashes to Ashes is not a straight account of each series, although the results and main contributors are detailed. It’s an Ashes history in the form of a fanzine. 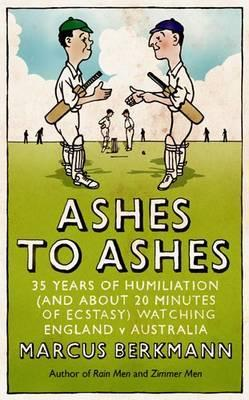 “I would like to think that it is the first emotional history of the Ashes” as Berkmann writes in his introduction. It is nostalgic, funny and unashamedly sentimental. People fondly recall Jim Laker and Peter West, relate their ‘A’ level results, even Elvis Presley gets a mention (he died during ‘Boycott’s Match’ – the 1977 Headingley Test). For those of us whose memories go almost as far back as 1972, and who have suffered along with the writer and his friends, it should make a reassuring accompaniment to this summer’s resumption of hostilities.